At last, it’s spring in the northern half of the world. Birds are singing and migrating, freshets are running, and trees are budding – yes, it’s time for all those things. But it also means that released and escaped nonnative gamebirds in North America – partridges, quail, and pheasants, mostly – are warily stealing from their hiding spots to roam the upland underbrush of the continent, occasionally crossing paths with momentarily befuddled birders in encounters that unfailingly send these birds scurrying back under cover, or cause them to take flight in a panicked flush. And given what these birds have been through, this caution is certainly warranted. There’s little doubt that these unwilling but plucky exiles have beaten the odds over the last few months, first evading the sights of eager autumn hunters, and then the jaws of hungry foxes and weasels, only to endure the many privations of the harsh and long North American winter eking out their survival in a strange and inhospitable landscape. But come spring, an even luckier few may even find a fellow survivor of their own kind with whom to start a family, unwittingly causing contentious debates among birders about the countability of established feral populations in the process. Despite their foreign origin, introduced gamebirds in North America seem to enjoy a better reputation among birders than other nonnative birds. Escaped partridges, quail, and pheasants are never as abundant or harmful as the much-maligned big three invasives – Rock Pigeons, European Starlings, and House Sparrows. Neither do they seem as painfully out-of-place in the wild as an escaped “exotic” cage-bird or farm animal like the Budgerigar or Red Junglefowl – and they’re generally more likely to fare well on their own. And because of the resemblance they bear to their New World cousins in the family Phasianidae, they even look the part of an “authentic” wild bird in North America. The same can’t really be said of a confusing Orange Bishop or gaudy Mandarin Duck loose in a city park. Unlike several other gamebird species commonly raised and released for hunting in North America, the Northern Bobwhite (Collinus virginianus) is, of course, a native of the continent, though its natural range lies mostly in the southeastern quarter of the continent, and south into Mexico and the Caribbean. Historically, the bobwhite was a favorite of game farms and private stocking ventures as far north as Canada, and while this practice has declined, out-of-range birds found today are almost invariably released or escaped birds – especially as wild populations of this species have declined in recent decades. What’s in a name? 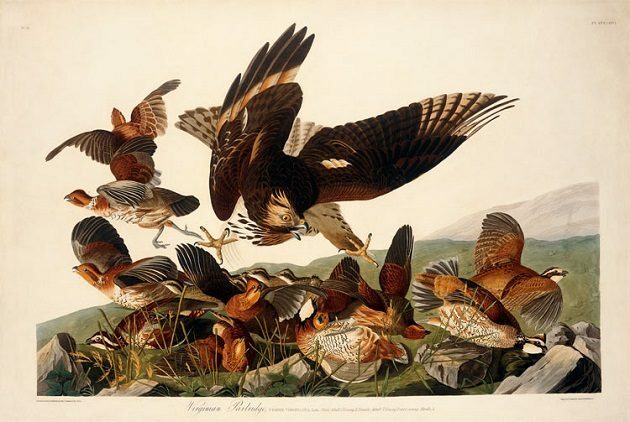 Audubon knew the Northern Bobwhite as the “Virginia Partridge”. The species has undergone a notable decline in recent decades. The only quail native to eastern North America, it’s also been reassigned from the family Phasianiadae to the New World quail family Odontophoridae. 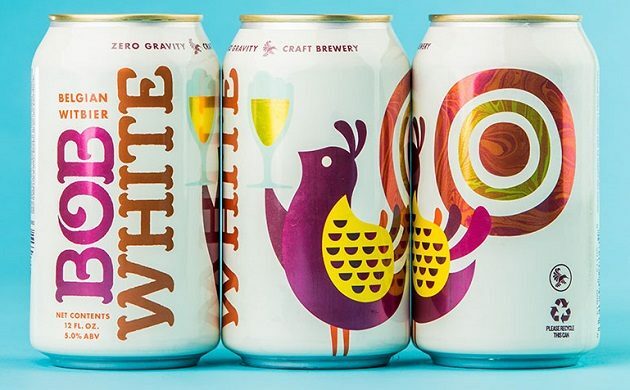 Bob White is both the name and mascot for this week’s offering, a seasonal Belgian-style wheat beer by Zero Gravity Craft Brewery of Burlington, Vermont. 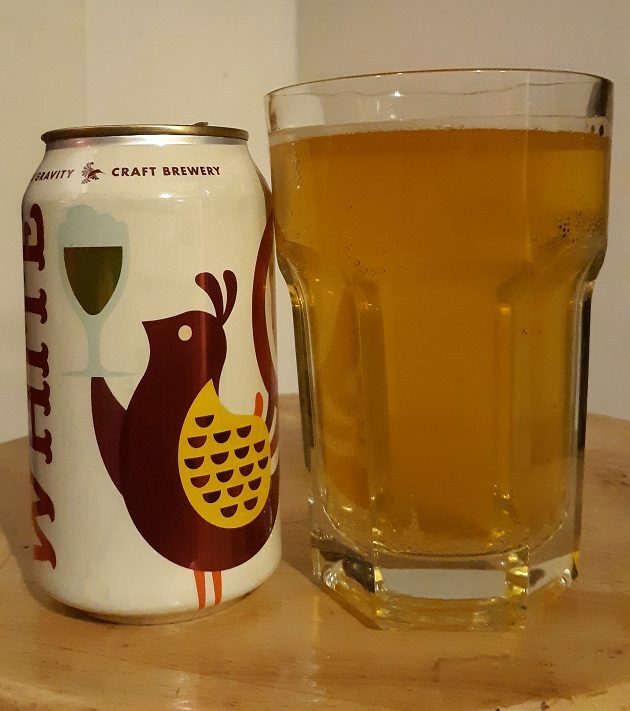 Semantically at least, “Bob White” makes a fitting name for a white beer, even if the namesake bird’s appellation has nothing to do with its coloration: “bobwhite” is really just an endearingly folksy, onomatopoeic approximation of the quail’s sharply whistled song. Any white on the Northern Bobwhite is mostly restricted to its striking throat and brow. But that’s fine: even the palest witbier isn’t anything close to white in color, even if the Dutch name literally translates as “white beer”. 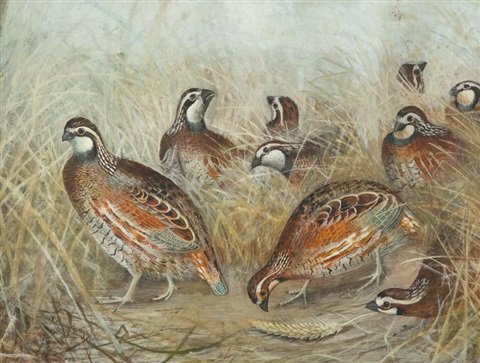 American artist Gerard Rutgers Hardenbergh painted these Quail in Wheat in 1883. While the recent emergence of both homegrown and imported wheat beers in the German and Belgian styles is generally viewed as a result of the craft beer renaissance of the 1970s and onwards, America has a much longer history of wheat beer brewing, mostly thanks to German immigration in the 19th century. As we’ve seen several times before here at Birds and Booze, the Belgian wheat beer style of witbier makes a perfect drink for early spring. Its light and refreshing character makes it a summertime favorite, too, but with its soft, pillowy mouthfeel and slightly warming spicing, it’s a style perhaps best suited to enjoyment when there’s still a bit of a chill in the air. This witbier is many shades darker than white, but it’s still a fairly pale goldenrod, with a faint, beady head. Bob White offers a classic Belgian wheat beer bouquet, with sweet bready aromas undercut by hints of coriander and orange. A smooth, fluffy texture elegantly combines flavors of ripe pear and sweet almonds with a spicy hint of clove and citrus, but finishes somewhat tart and dry.